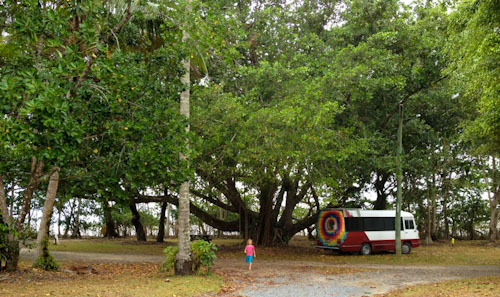 While camping on the beach north of Mossman, we were blessed to meet up with friends from the Rainbow Gathering where Elijah was born. It was also good to be so close to the beach where the girls found lots to play with, although the water was not terribly inviting. Although I was warned about the crowds along the beachfront parks, we have no trouble finding space to park for a couple of nights! Brioni is delighted by all the coconuts along the beach and collects a pile of them. 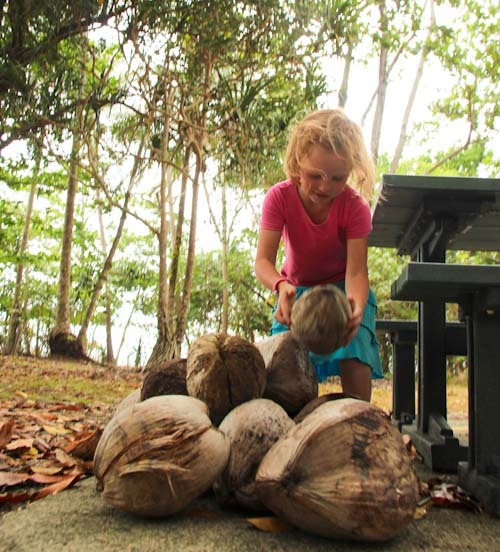 Later, Brioni bags up the coconuts and bring them inside. In such a small living space, these make the space seem cramped, but we're at the beach and spending most of our time outdoors, so I leave them alone until Brioni is ready to take them back outside. It's lovely to be reunited with Karin and her warm personality. 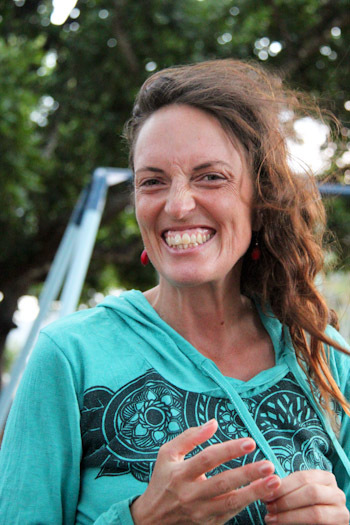 She helped birth Elijah and has spent the last twelve months travelling around Australia with her family. Many of the Rainbow Family who came around us this evening had lived along side us for weeks while we were camping in the bush at Glendon Brook. They saw how we lived, how we treated each other, how we spoke to our children, and how we approached life. Some were even there when I birthed Elijah, and those that weren’t there in person supported us in spirit. Because of this, after Elijah’s death these special friends freely extend the same love and compassion to David as they do to me. It was the first time for them that I was able to explain the circumstances surrounding Elijah’s death and David’s arrest. I’m not sure where they had previously heard their stories — I didn’t ask — but I could tell that hearing the truth of that night from my testimony was comforting. Rainbow Family members are always open to a continuing relationship with us, and they don’t place limits, barriers, judgements or conditions on our friendship. It’s a joy to be surrounded by such unconditional love, and it reminds me that there are so many wonderful people available to demonstrate the way of love to me and our children, so I can let go of those with whom I am disappointed. 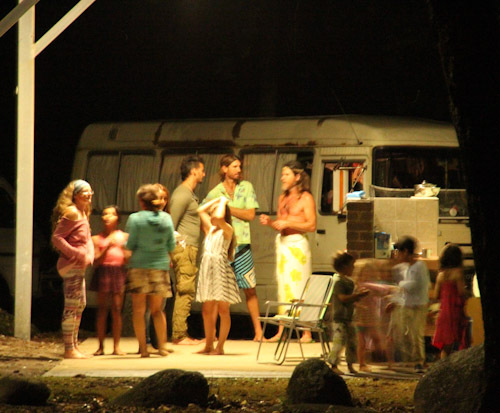 In the evening, all the Rainbow Family members who are camping in the area come together to share a meal and talk. Another housebus the same size as ours is parked in the background, but it's home to ten people, not five! I desire that our girls to continue to grow up in an unconditionally-loving environment. As well as modelling this for them, I can also surround them with adults who talk to them respectfully, who don’t judge behaviour but assess their unspoken needs, who see their potential and don’t compare their performance. These people exist — we have lived among them for a time — and they will be the village that will help raise our girls in the absence of a father. So beautiful! I really wish that the Rainbow Family was as active in the US as it appears to be where you live, I’d love to plug into it. Do you talk to or visit David very often? I’ve been wondering how he is doing, too. Lauren, I’m very glad to hear you have a space where you can share the story on your own terms, and receive love and acceptance and compassion. I think of David often, and send him thoughts of compassion. How wonderful to see all those lovely familiar faces again! 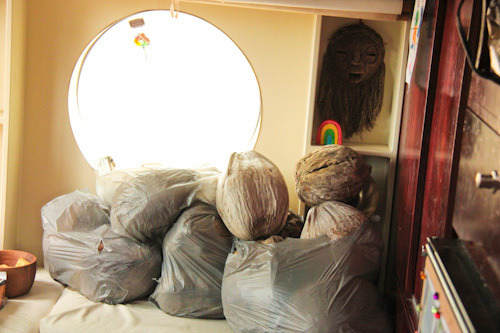 Lily, the Rainbow family IS very active in the US – in many locations more so than in Australia! What a joyful face Karin has! I’d love to be associated with the Rainbow Family. I had a look at their website but couldn’t find any information of their next gathering. Are people invited or does one just show up?